Challenging the gods has never been so profitable, as those who spin the reels of Age of the Gods King of the Olympus will surely discover. Age of the Gods: King of the Olympus slot delivers indiscriminate profits from the Pantheon of Greek Gods. Playtech software shows its true power in the Age of the Gods: King of the Olympus slot machine and there are no technical glitches to worry about. Once you discover the true power of Zeus, the symbols depicting the leader of all Gods will be a pleasant sight. The Pantheon of Mount Olympus has plenty of other amazing characters and they can all trigger winning combinations. In the right sequence, the gods and goddesses will produce a significant return on investment. All the prizes however pale in comparison to the ones bestowed upon lucky winners by the King of Olympus. 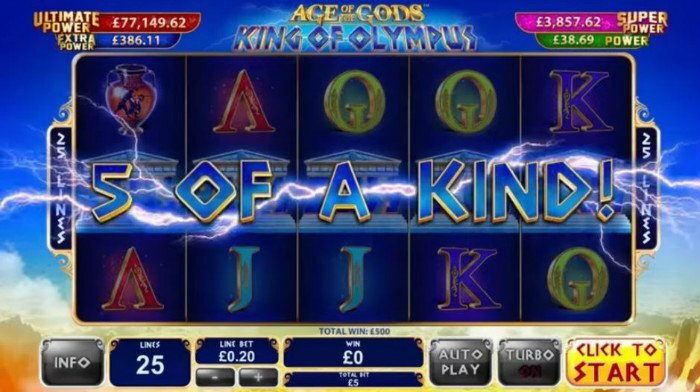 Age of the Gods: King of the Olympus slot machine was developed with the obvious intention of celebrating Greek mythology. Its 5 reels and 25 pay lines are abundant in characters depicting creatures of old, such as the Pegasus and eagles. Don’t let the mundane cards symbols ranging from Ace to Jacks deceive you, because at its core, this slot is all about the ancient gods. Age of the Gods: King of the Olympus video slot is a Playtech classic. It was the first release in the series and that’s why players have so many fond memories about it. Much simpler than the sequels, it captures the very essence of the franchise. The Zeus bonus free spin feature is the only one offering bonus rounds, but it leaves nothing to be desired. It all comes down to how confident players are in their abilities and how much they rely on luck. Age of the Gods: King of the Olympus provides you with the impetus to make the transition to higher stakes even if you’re a beginner. Nothing brings players together as quickly as the possibility of winning a jackpot worth $300,000. Just when you thought that things couldn’t possibly get any better than this, know that the amount described above is just the standard play jackpot. 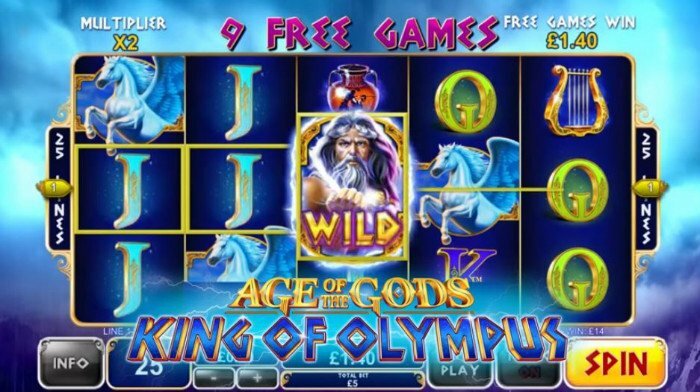 The Age of the Gods: King of the Olympus progressive jackpot is shared by all the games in the series. Zeus is the central character in this particular game, but the other Gods from the Greek Pantheon play an equally important role in other games. It is obviously more difficult to win the progressive jackpot, but that’s the beauty of it. One would have to spend more time and bet larger amounts to have a chance at winning what promises to be a life-changing sum. Age of the Gods: King of the Olympus slot machine progressive jackpot is shared by all the casinos on the Playtech network. This might not sound as much but it’s actually a big deal if you think about how many operators use their software. Ideally, players should focus on short-term results, rather than channeling all their attention towards this ambitious objective. You only need to get lucky once to change your life forever, so play the long game but celebrate immediate gains. It is hardly a coincidence that Zeus is significantly larger than any other of the characters and numbers populating the reels. He is a frequent presence and at the same time a welcomed sight, since he never comes empty-handed. Simple and exciting, this is how an Age of the Gods: King of the Olympus slot review would describe this game. During the free spins, players also have the chance of maximizing their profits through multipliers and win as much as 80 times the stakes. Age of the Gods: King of the Olympus free spins are also accompanied by glamorous animations. Zeus uses lightning and thunders to deliver indiscriminate free spins and bonuses upon players. Add to this the fact that their players are always chasing one of the four possible progressive slot jackpots and you’ll understand why this is such a popular game. Without stripping the other gods of their magnificence, they don’t stand a comparison to the God of thunder. Age of the Gods: King of the Olympus slot machine does a brilliant job at capturing him in all his glory and power. You almost feel the energy of this mythical creature when his image appears on the active pay line. 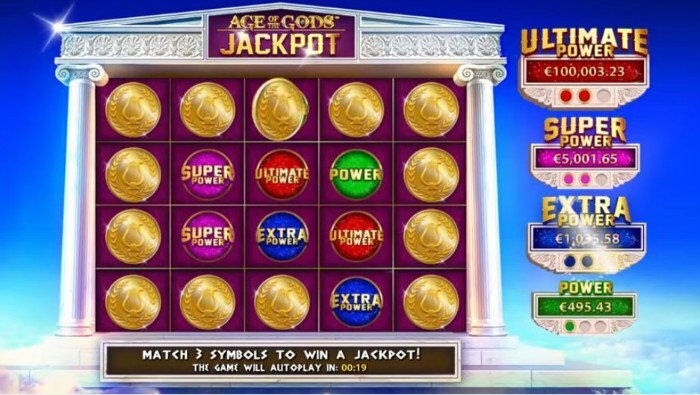 All the reels start vibrating and as the symbol replaces other signs, free spins and bonuses will overwhelm you. Don’t let the image of Zeus deceive you, because behind the image of a gray-haired Sage, lies a God with supernatural powers. It can bind together the other artifacts and items that appear on the reels and turn regular profits into spectacular payouts. The winged horse Pegasus takes flight to deliver the will of the gods. Thunders and lightening mark his arrival and the awesome artwork of Age of the Gods: King of the Olympus slot brings shivers down the spine. Money makes even the world of Greek gods go round and there are winnings fit for a God when spinning the reels of Age of the Gods: King of the Olympus. Bet a cent, a handful of dollars or as much as 100 if you are bold enough and the rewards will match your courage. The regular payouts are so impressive that even if you never win the Age of the Gods: King of the Olympus jackpot, money won’t be of the essence. - 4 different progressive jackpots which are randomly triggered. - Low to medium slot volatility. - Fewer special gameplay elements compared to others from the same franchise. - Intense competition, as jackpot is pooled across Playtech network.